Had a lovely lunch today at l'Ultime Atome, a great restaurant just off Place Saint-Boniface here in Brussels. 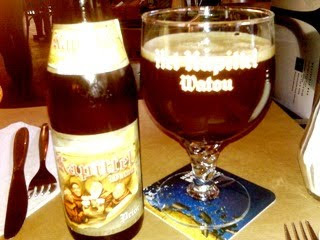 It offers an impressive Belgian beer selection, and I opted for a bottle of Kapittel Watou Prior. I wasn’t disappointed. It is actually not a million miles away in taste from my beloved St Bernardus Prior 8. Dark and rich, with dried fruit notes. Perhaps it’s more bitter, and there’s a hint of marmite. But it’s a lovely beer, no doubt. I suspect it's better than Kapittel Watou Dubbel, though to be fair, that one might have been served too cold.